Explosions and fire on ships have been the main headlines in the year 2018. 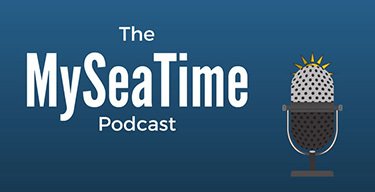 If you’ve been keeping up with the latest shipping news, you know what I am talking about. Fire on tankers is the most dreadful thing to imagine, specially in case the tanker is a loaded tanker. But there was a time when safety on tankers used to be the only concern. In present world, we need to do things safely and we need to do it economically. For example if you are inerting a tank with shore nitrogen, doing it safely is not the only criteria. Of course, it is the most important one. But you will also be questioned about the time taken in inerting the tanks and amount of shore nitrogen that you have used in doing so. There are creatures out there who are counting each second of extra time taken and each gram of the additional resource used. And they aren’t doing anything wrong. Market is tough and competitive. An ounce saved is an ounce earned. The only way to do the things safely as well as economically is to understand the task inside out. Why we are doing it and how do we do it? In this post I will discuss about inerting of cargo tanks on tankers. Which means that one element of fire-triangle (Fuel) is always present on tankers. And we know that oxygen is omni-present. The only thing stopping the completion of fire triangle would be the source of ignition. Considering what is at stake, the safety of tankers cannot rely on just one single barrier. For this reason, the oxygen level inside the cargo tanks need to be such that even if the source of ignition is accidentally present, the fire triangle would still not complete. 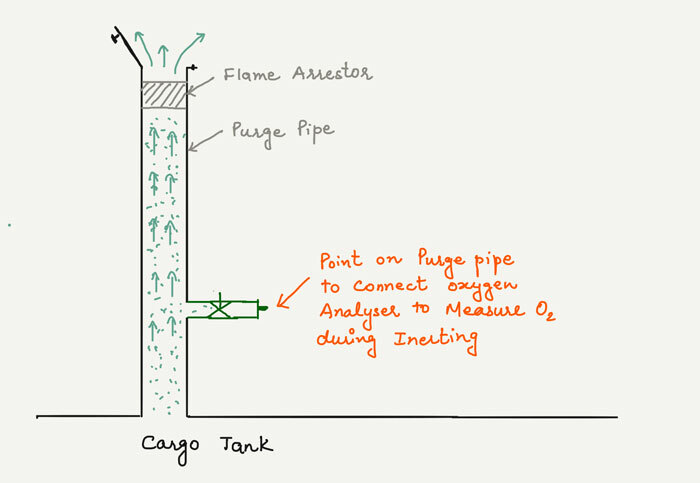 The process of reducing the oxygen level in the cargo tank is called inerting. Oxygen content to less than 8% is required to be in the tanks containing flammable cargoes. And to be able to bring the cargo tank to that oxygen level, Inert gas containing less than 5% of oxygen is introduced in the cargo tank. The time required to inert a tank to less than 8% of oxygen level from 20.9% of oxygen level !!! If you just introduce the inert gas in the cargo tanks without a plan, you may end up doing this endlessly with cargo tank still at more than 8% oxygen. There need to be a plan and use of specific method and techniques of doing it. Broadly there are two methods of doing it. Both very effective but we need to choose one. Here is what these method of inerting are called. 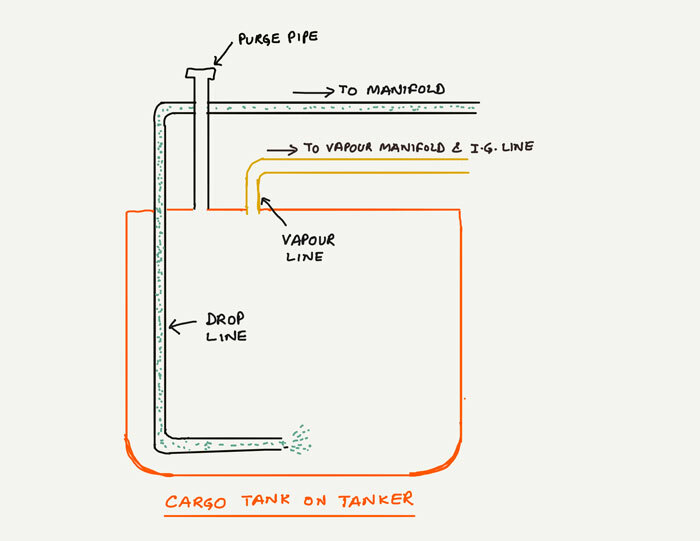 Before we get to these methods, we must understand the basic pipelines structure inside a cargo tank. 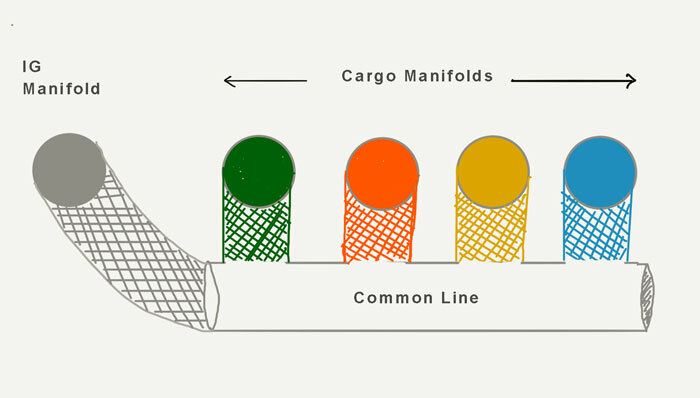 There is a drop line through which cargo is loaded. There is a vapour line (or IG Line) which is connected to the IG(inert gas) line. The same line may form as the Vapour line on the manifold. And then there is a purge pipe. On some tankers (specially chemical tankers), one part of PV valve may act as a purge pipe. Now let us get back to the method of inerting. As the name suggests, with this method we reduce the oxygen content in the tank by diluting the air inside with inert gas containing lesser oxygen (less than 5% by volume). We keep on diluting it till the time the oxygen in the tank is less than 8% by volume. Usually this is achieved with 3-4 air changes. For example, let us say that the tank is of 4000 m3 capacity. This means that when we have diluted the air inside the tank with about 12000 m3 of inert gas, it would have around 8% of oxygen by volume. But that is only when it is done correctly. Okk, let us first see how it is done. We supply the inert gas through IG line and we open the purge flap of the purge line to let the air inside the tank escape. 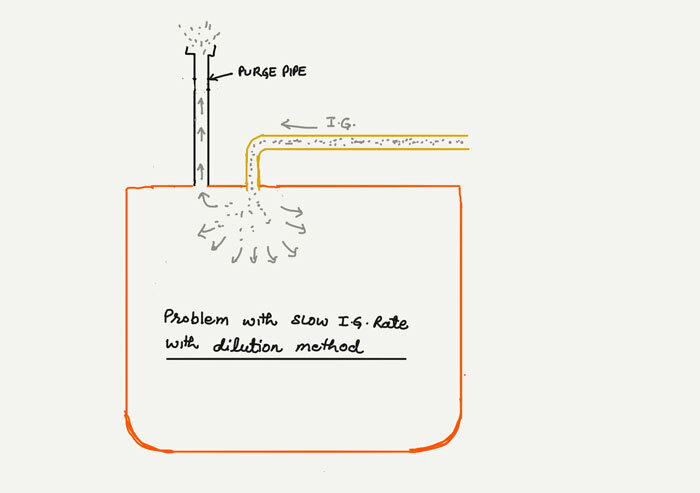 The velocity of the inert gas entering the tank need to be more in this method. Because we need to dilute the air inside. If the velocity of the inert gas is less, half of it may escape through the purge pipe and the dilution of the air will not be to the maximum capacity. This would take much longer time to reduce the oxygen level in the tank. So if we need to inert say 10 tanks and if decide it to be done by dilution method, we cannot open all the 10 tanks at one time. If we start inerting all the 10 tanks with dilution method, the velocity of the inert gas entering the tanks will be too low for dilution method. So in this case, we can start with 2 tanks. Once these two tanks are inerted to less than 8% oxygen we can switch over to the next set of 2 tanks. 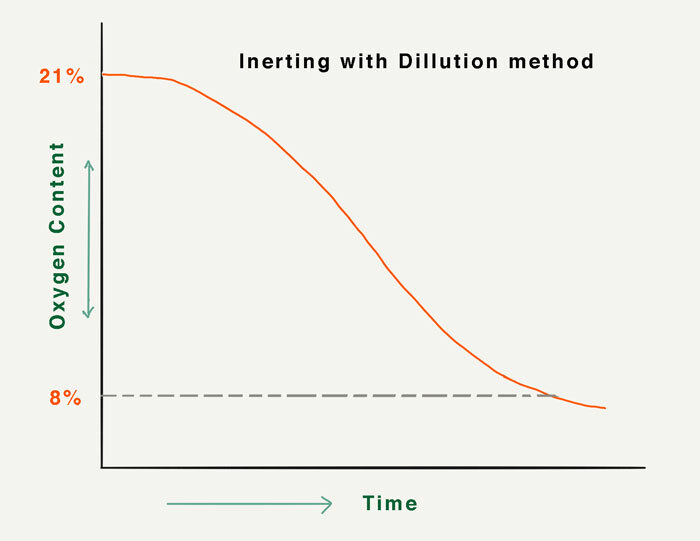 Displacement method is little different from dilution method. 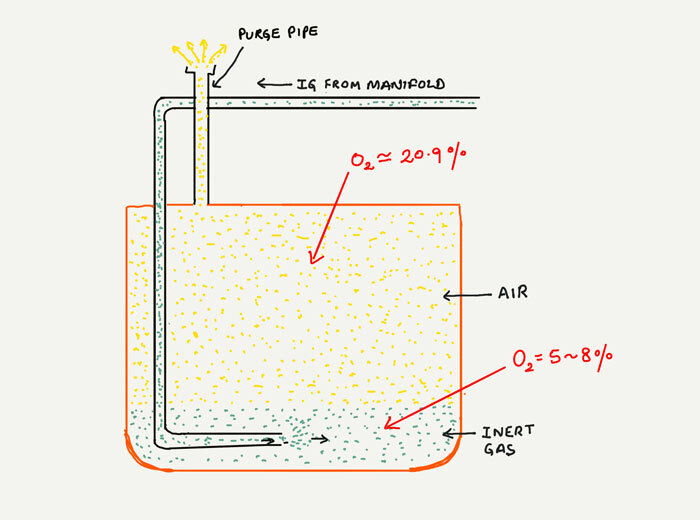 In this method, we displace the air inside the tank with the inert gas. With this method close to one air change is required to achieve less than 8% of oxygen from initial 21%. oxygen in the tank. 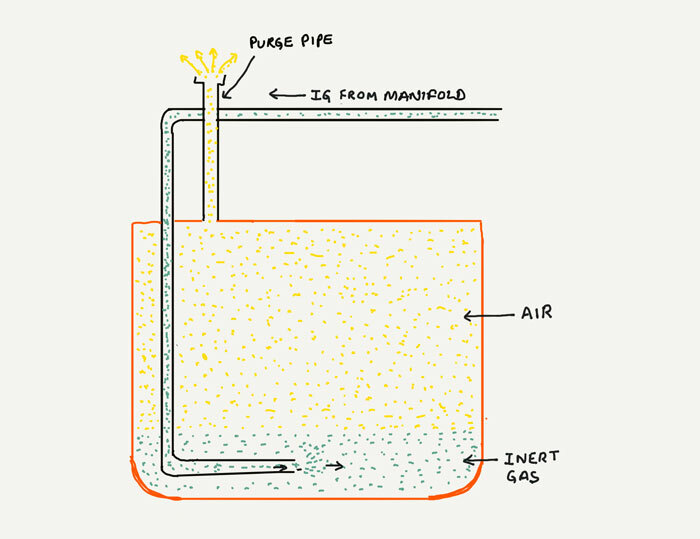 In this method, the inert gas is introduced from the bottom of the tank. This is done by supplying the inert gas through drop line of the tank. To be able to do that, IG line need to connected to the cargo lines at the manifold. If multiple tanks are to be inerted, these tanks can be connected to the common line and then IG line can be connected to the common line. We then need to set up the cargo lines just as we do for loading through drop line and start the IG. Now the inert gas will enter the cargo tank from the bottom part of the tank (through drop line). As the inert gas fills the bottom of the tank the existing air (with 20.9% oxygen) will keep on exiting through the open purge pipe. The idea is to gradually and slowly displace the air inside the cargo tank with the inert gas. And one thing that we need to ensure during this is that the inert gas must not be mixed with the air exiting through the purge pipe. Otherwise it will take longer time to reduce the oxygen content of the tank. And the only way to ensure that is to introduce the inert gas inside the tank at slow rate or speed. As you would note that this rule is completely opposite to the dilution method where the inert gas was required to enter the tank at high speed or rate. So when inerting the tanks with displacement method, we need to keep at least 4-6 tanks open when IG is running at full capacity. Which method of Inerting to choose? Both the methods of inerting cargo tanks are equally good and effective. But we cannot choose both the methods. When inerting a tank, we need to choose which method we need to use for inerting. The decision is not that difficult. It all depends upon two factors. 1. how many tanks we need to inert? If there are only one or two tanks for inerting, we definitely need to inert with dilution method. This would be faster. If we use displacement method in this case then we would need to run the IG at the reduced rate and thus it would take more time to inert the tanks. But if there are 10 or more tanks to inert, displacement method would be faster. This is simply because with displacement method, ideally close to one air change is required in one tank to bring it to the required oxygen level. With Dilution method it is close to 3-6 air changes. And then there is an area in between that range of number of tanks in which you can choose either of these methods. Whatever I said in the first point (number of tanks), that was based upon the use of ship’s Inert gas plant for supply of inert gas. But sometimes we do need to inert with short IG (mostly nitrogen). This is particularly the case with chemical tankers with no IG plant. If the charterers require the tanks to be inerted, the IG (nitrogen) is supplied by the shore. In this case, to choose the inerting method not only the number of tanks would matter but also the rate of shore IG supply. For example if the rate of supply is only 100 m3/Hr, even if there are 1~2 tanks to inert, it would still need to be done with displacement method. Similarly, if the rate of supply is as too high, even if there are 10 tanks to inert, it may be required to inerted with dilution method. You have done everything right so far. Chose the correct method of inerting and set up all the lines correctly. But that would not do any good if you do not correctly monitor the inerting operation. The monitoring need to be such that anything wrong must able to be identified as early as possible. 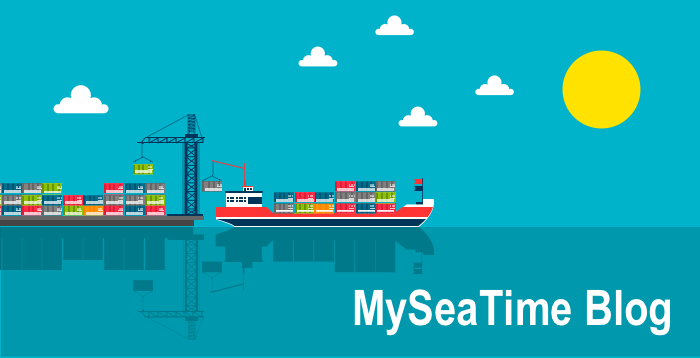 Apart from safety of the crew exposed to inert gas, there are two main things that we need to monitor. There are multiple locations from where the oxygen content of the tanks can be checked during inerting. But it is so much important to choose the correct location for measuring oxygen content. For example if you are inerting with dilution method (inert gas entering from top of the tank), then it is important that the measurement is taken from the bottom of the tank. In this case if you measure the oxygen content at the top of the tank then your readings may be wrong because of inert gas entering the tank from a nearby point. Similarly, if you are inerting with the displacement method, it is important to measure the oxygen content at the top of the tank. This is because the oxygen content in this case will be drastically different at bottom and top of the tank. So it is important to decide the location from which we need to measure the oxygen content of the tank during inerting. Next we also need to be aware of the points from where the oxygen content can be measured. For the purge pipe the oxygen content is checked from the air coming out of the purge pipe during inerting. No, you do not need to climb up and expose yourself to the gas coming out of the purge pipe. There is usually a point given on the purge pipe from where you can connect the inlet of your oxygen analyser. 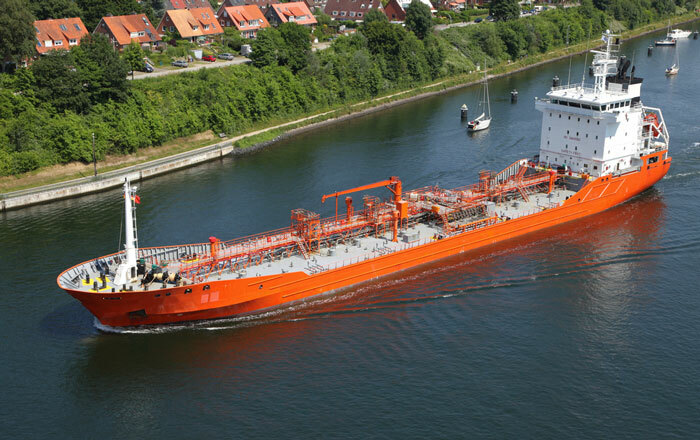 On chemical tanker, sometimes there are two identical points that are given on the purge pipe (On chemical tankers PV valve line usually acts as purge pipe). One of these point is for nitrogen padding from nitrogen bottles. This point has a non return valve fitted and thus will not give any reading if used for measuring oxygen content. In this case, we must know and identify the point which is for measuring the gas concentration in the tank. We can measure the oxygen content from the UTI port (Vapour lock) too. From here we can measure oxygen content at the top of the tank or at the bottom of the tank. We just need to lower the oxygen analyser inlet tube of that length. What to expect during monitoring oxygen content? We have started the inerting of the tanks. After one hour we measure the oxygen content of the tanks. How much reading we should expect? If we do not know this, we may not be able to find anything wrong that we may be doing. Knowing what to expect would really help in this case. For example, if the oxygen reading after one hour is much less than we expected, the reading could be wrong. And if the oxygen reading after one hour is much more than we expected, we could be doing something wrong that can be corrected at this early stage. But the question remains, how much reading should we expect. It is not that difficult. 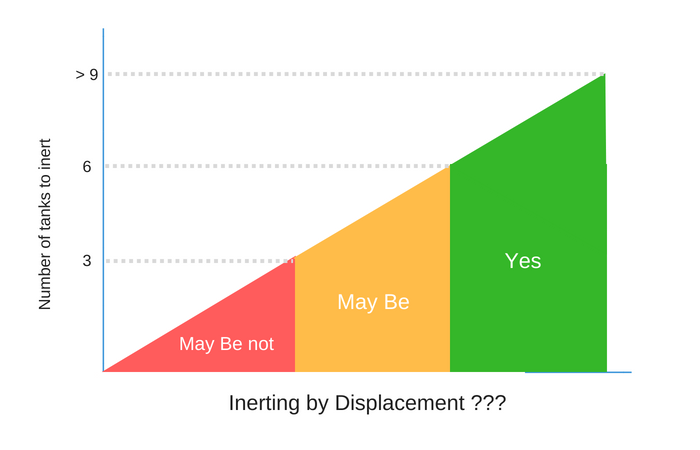 Jut look at this image of displacement method. Let us say this is the situation after one hour. If we measure oxygen content at this stage from the purge pipe, what reading you would expect? Yes, you got it. Close to 21%. 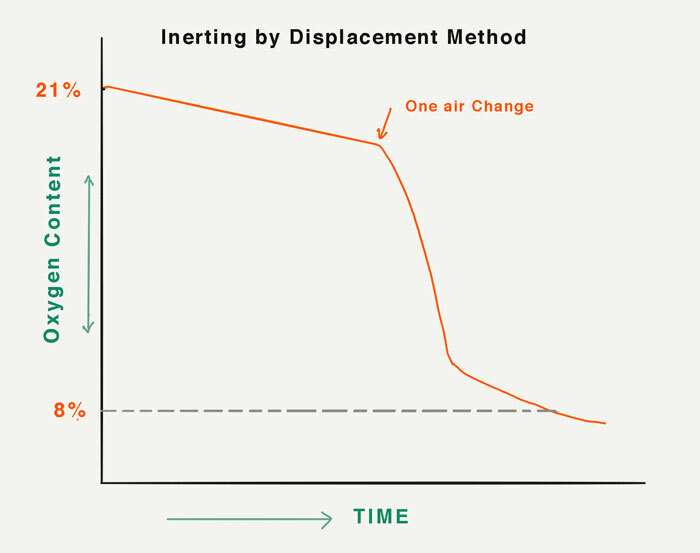 Because in displacement method, it would mostly be air that will come out initially. It is only when you have supplied amount of IG close to the capacity of the tank that you would see sharp decrease in oxygen reading of the tank. For example let us say the capacity of your cargo tank is 2400 m3, capacity of IG plant is 3600 m3/hr and you have opened 6 tanks for inerting with displacement method. Which means each tank is getting IG with approx rate of 600m3/hr. In this case the tank would take approx 4 hours for inerting to less than 8% oxygen content. If we chcck the oxygen content in first or second hour, we would find very less change in oxygen content. But now that we understand, there is nothing to worry about it. 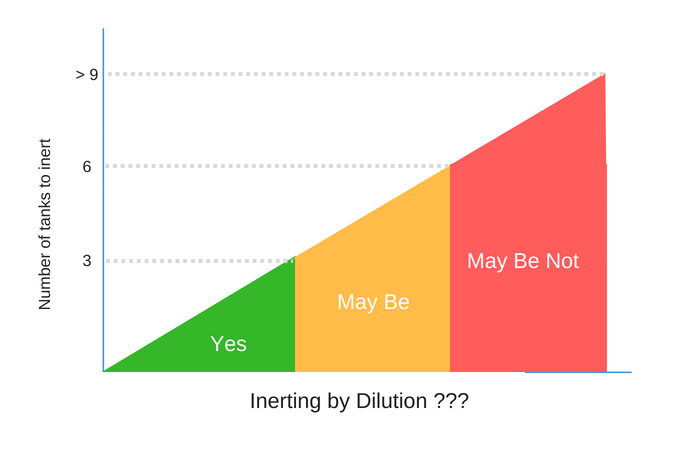 With dilution method it is just the opposite. In dilution method, the inert gas is continuously getting mixed with the air inside the tank. Which means that the oxygen content is continuously reducing inside the tank. Remember we are measuring oxygen at the bottom of the tank in dilution method !!! The principle of gas freeing is not different from the inerting that we discussed so far. Displacement and dilution methods are applicable for gas freeing too. I will discuss the process of gas freeing in detail in one of the future blog. The only way to be able to do something safely and economically is to know the job inside out. Otherwise it is either safe or economical. Inerting is one such job that needs time. But if the inerting is not done the way it should be, the time required can increase multiple times. Ur explanations are crystal clear Capt. Very comprehensive and easy to grasp. Thanks Ivan...Glad you liked it. Great articles Capt. Rajeev. Excited to read the next article. Yes, that is also one of the method. Pls note that when IG passes through lines and valves, it gets sooth deposits embedded. There are high chances to loose valve integrity while passing IG from one tank to other using lines other than for direct IG inlets. Thanks a lot sir for clear understanding specially 3-4 air changes for dilution method and 1 air change for displacement method. Padding is usually done with not more than 1 inch or lesser size hose. Padding with 8 inch hose is dangerous. Will write on that in near future. Thanks. The way you explain the thing are, sooo simple and clear. many thanx for upload sir. Thanks, Good compare to others Capt. Dear Capt Rajeev Jassal Pls one more explanation about how to effectively purging Cargo tanks to reduce H2S,with putting stress on outlet vapor. As usual your articles are written with basic terminology. Very helpful in understanding. Please keep posting more frequently(if possible). Awaiting for more such tanker topics Like crude oil washing etc. Thanks Sir. Good day sir, Your article's on various topic are very useful fginor us, i request you to please post a article on step by step loading and Discharging operation on Oil tanker. Which include all stages of operation, so that it will Help to understand tanker for non tanker students. Waiting for your positive reply. Very nicely explained , I really love to read your blog. Always waiting for new updates . 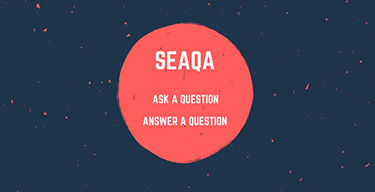 The best thing I like about this blog is that its quality over quantity.